UTA researchers are creating a more sustainable, affordable North Texas for the future. From carbon dioxide conversion to landfill mining, researchers at UTA are seeking viable alternative energy options. 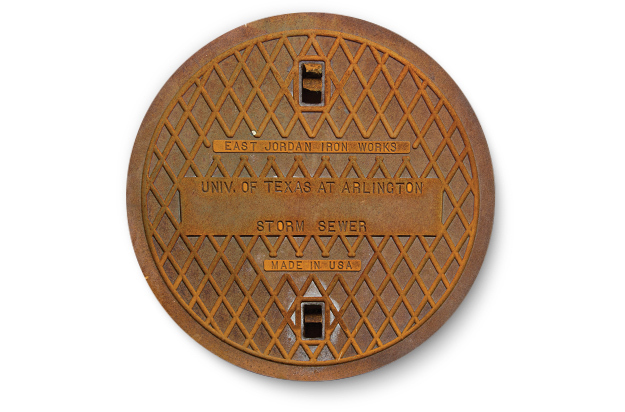 Arlington has more than 19,000 manholes citywide, and if they corrode, they could threaten the structure and quality of sanitary sewer mains. Melanie Sattler is taking preventative steps to combat this issue by evaluating more than 350 concrete manhole shafts in Arlington for corrosion. Dr. Sattler, the Syed Qasim Endowed Professor of Civil Engineering, is leading a team that includes Victoria Chen, the George & Elizabeth Pickett Professor in the Department of Industrial and Manufacturing Systems Engineering, and Arpita Bhatt, an adjunct professor in civil engineering. They will inspect the manholes, measuring hydrogen sulfide and multiple other parameters that influence corrosion, then develop a method to prioritize which ones need protection the most. The team will use sensors to measure the amount of hydrogen sulfide present, study velocity of flow, and inspect corrosion that might already be occurring. Each manhole is 4 to 5 feet in diameter and can range from 4 to 45 feet tall. When manhole shafts corrode, they can threaten the structural integrity of sanitary sewer mains, and the damaged shafts can allow rain and other runoff from the surface to enter the wastewater system. Although the study will work on corrosion protection for the 350 manholes inspected, the more important aspect of the project is to develop a system for prioritizing the rest. "The new study will give Arlington water engineers and other cities across the country the data they need to protect vital infrastructure and spend funds wisely," says Buzz Pishkur, Arlington's water utilities director. "We are fortunate to have a center of research in our city, and we value the partnership with UTA on this and other infrastructure efforts." UTA, an R1: Highest Research Activity university, continues to make great strides expanding our research enterprise, including support from a wide variety of sponsors. © 2018 The University of Texas at Arlington. All rights reserved.